The next generation of Jeep engineering is here, and you can experience it for yourself by sliding into the driver's seat of the new 2018 Jeep Compass. This new Jeep offers a spirited and efficient powertrain, a capacious and versatile cabin, and a myriad of impressive technology perks that will make your new vehicle the road trip SUV of choice. Visit our Jeep dealership in Haverhill, MA, to buy or lease the new Jeep Compass today. The new 2018 Jeep Compass is available right now at Bill DeLuca Chrysler Jeep Dodge Ram so don't miss out! 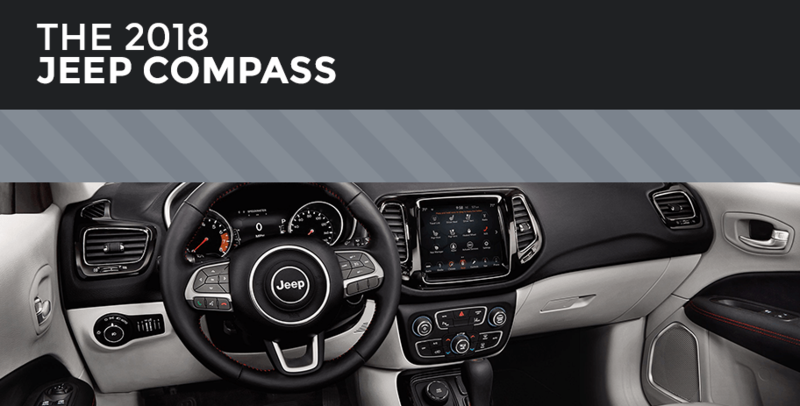 Buy or lease the 2018 Compass today.